Contributions to the Park Foundation are made by hundreds of foundations, organizations and individuals like you. Appreciation is extended to last year's donors. 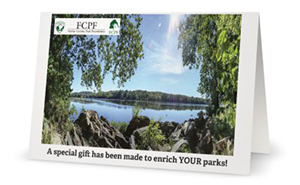 There are many ways that your support can help Fairfax County Parks thrive. Learn more about each and choose what suits your interest. For the person who seems to have everything or is difficult to surprise, consider making a donation to the Park Foundation in honor of a special friend or family member. You can celebrate a special occasion or remember the life of a friend or loved one. 1. 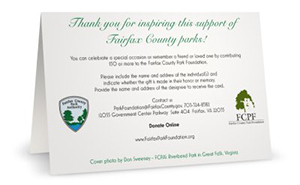 Contribute $50 or more in their honor to the Fairfax County Park Foundation. 2. Provide the name and address of the individual(s) to be notified. 3. Indicate whether the gift is made in their honor or memory. 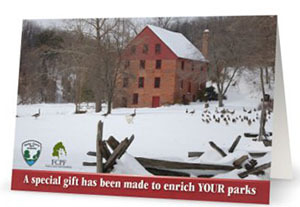 The Park Foundation will mail this beautiful card (featuring Riverbend Park or Colvin Run Mill in Great Falls, Virginia) to share that a commemorative gift was made. Contributions made to the Park Foundation are tax-deductible to the fullest extent of the law. Thank you for investing in YOUR parks, a key element of Fairfax County’s quality of life!